Bring wealth home this year by investing in these 15 New Year Stocks. Here is top picks from best brokerage house. 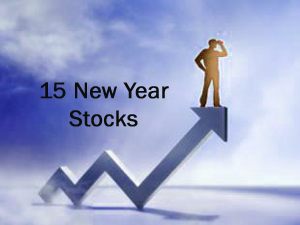 All these new year stocks are dhamaka stocks and surely gives good return in coming New Year. From last diwali to this diwali nifty has given 27% return. This stock market bull run is likely to continue in new year. Stocks given below are stocks that will rock your portfolio. Invest in Ajanta Pharma with target of 2121 Rs/- – Stock recommended by Nirmal Bang. Ratnamani Metals and Tubes is good stock. Edelweiss recommend to invest in this stock with target of 541 Rs/-. Invest in Ashok Layland. Axis securities recommend to invest in this stock with target of 60 Rs/-. Centrum is recommending to invest in PVR with target of 950 Rs/-. India Nivesh is advising to invest in Meghmani Organics with target of 36 Rs/-. Mint Direct advise investor to invest in Sutlej Textile with target of 450 Rs/-. Invest in Mangalam Cement with target of 337 Rs/- stock recommended by Angle Broking. Invest in India Cement with target of 146 Rs/- stock recommended by Angle Broking. Nirmal Bang recommend to invest in Sharda Cropchem with target of 328 Rs/-. Invest in Yes Bank with target of 687 Rs/- stock recommended by Nirmal Bang. ICICI direct advice to invest in Maharashtra Seamless with target of 430 Rs/-. Invest in DCB with target of 110 Rs/-. stock recommended by Motilal Oswal. India Nevesh advice to invest in RIL with target of 1274 Rs/-. India Nivesh recommends to invest in Capital First with target of 360 Rs/-. Celebrate New Year with joy by investing in stocks given above.